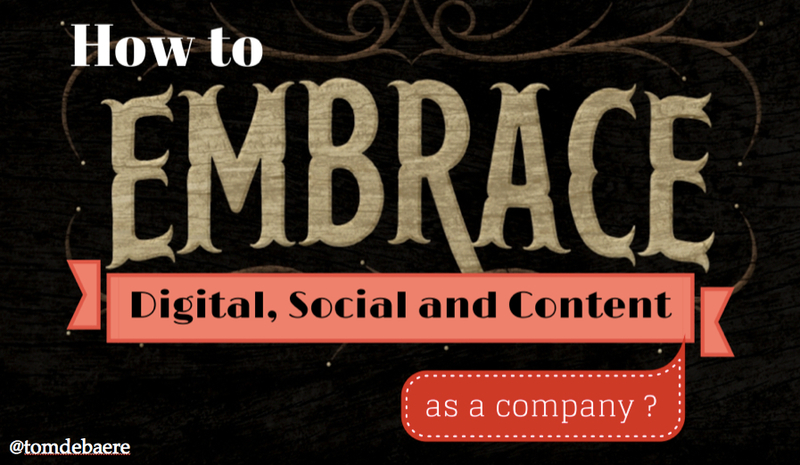 How to Embrace Digital, Social and Content as a Company? The reactions where heartwarming. Although I knew I had a nice story, I didn’t expect these fantastic reactions. A couple of week ago I presented to around 60 B2B decision makers. The topic was basically about the biggest challenges of marketers today, and how they can solve these challenges. When I posted a trimmed down version of my presentation on Slideshare, I got another happy surprise. It got voted “presentation of the day” on Slideshare. I think that’s pretty cool. And that my friends, as you can imagine, made me a little bit proud and totally made my day. Consumers and businesses today buy different. They are less and less influenced in their buying behaviour by advertising, although advertising remains a relevant tactic if applied correctly. They are influenced by whom they talk to, online and offline, and what information comes to them through the internet and social media. Today, the explosion in the number of social and communication channels, the abundance of content, globalization and the rise of social networking have transformed the buying behaviour of customers: buyers have a lot of distractions (smartphones, tablets, social media) and are reacting lesser and lesser to advertising, have become blind for irrelevant content, and reaching out to their peers in on- and offline networks for buyer advice. These changes are cause a shift in power from the seller to the buyer. These changes cause organization to think about how they can become more transparent and authentic. Channel overload: people have an expanding number of channel choices, how will you as marketer reach your buyers with so much channels and content available? Changing buyer behavior: social and the web have caused people to buy differently. The have all the information at hand to make their short list, before they even need input from a vendor. Immediately stepping into social media without understanding that you need to give, and give, and give again, in order to get. But what do you give? Doing email marketing without fully understanding what customers want from you, so they do open and click that email. But what do they want from you? Believing that Search Engine Optimization will drive traffic to your website, not knowing that only relevant content is driving traffic to your website. But what do they consider relevant content? Blogging about what you think is interesting for your customers, forgetting that you should try to monetize every blog post, and that it’s about much more than writing and publishing. But what is interesting to them? Build structured processes to listen to customers: many marketers will say they know they need to listen to the needs of their customers. But all of you know you are not doing it enough. Help the organization to understand they need to contribute to content creation and social media amplification. Why do you need to involve the complete organization? If you want your customers to trust you, and be interested in what you have to say, you’ll need to activate people across the complete organization. That’s because people don’t trust CEO’s and marketing departments anymore…. Just check out the 2014 Edelman TrustBarometer which was released yesterday. You’ll notice a remarkable shift in 2012, where it became clear that trust and expertise is brought by your experts and by people like yourself. People trust people. Peers trust peers. Another reason you need to activate the organization is that marketing cannot possibly be present in all the social networks (online and offline) where your experts and peers reside. They don’t speak the right language, and are not trusted in these networks in the first place. How do you change the organization to embrace digital, social and content? This is where it becomes interesting. Knowing you cannot force people to create content, or amplify on social, you’ll need a bottom up change management approach. You need to make people feel they need to contribute to this change. Educate people in the reasons why this change needs to happen. Help them understand what role they can play. Take away the barriers they see in terms of time, processes and skills. Develop new processes to listen to customers and answer their questions. These answers help your business forward, and help the customer forward on a personal level and business level. Assign a team to orchestrate the creation of strategic content marketing and content strategy initiatives. Anchor the change in your HR processes. Start with the organization. Starting with a strategy and tactics never works. How are you preparing your organization to make this change?